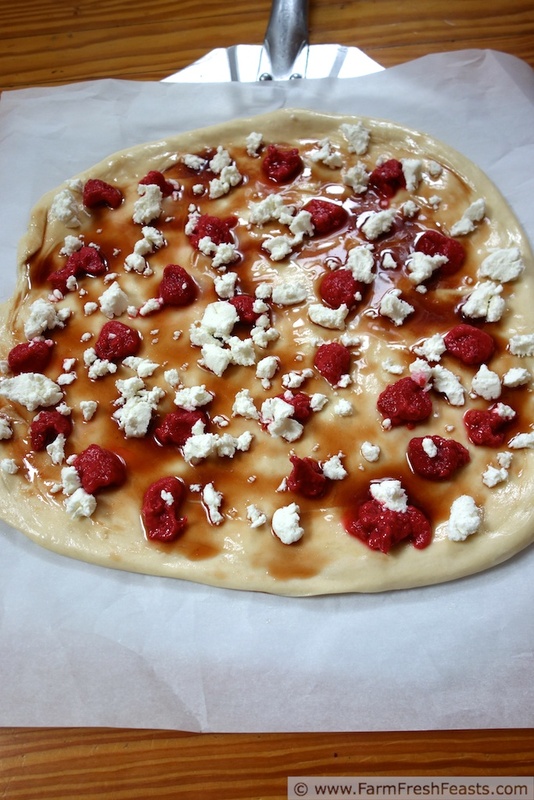 A savory-sweet combination of raspberries, goat cheese, and balsamic syrup on a tender buttermilk pizza dough. An excellent light pizza for a summer evening. Pizza, for me, is a way to incorporate what we've got handy from the farm share into a hand held cheese-topped delivery vehicle. Since I make pizzas most every Friday night, it's a routine around here. Marching band season will throw a wrench into this scheme, but we like our pizza too much to let that stop us--I'll keep posting pizzas on Fridays even if we're not eating our newest pizza (and I'm not posting the fresh shots on my FB page on the same day. The Spirit of the Friday Night Pizza will endure while I'm volunteering at the concession stand doling out . . . ahem . . . Marching Tacos. [As an aside (can I do an aside within an aside?) I really would not consider myself a Foodie or a food snob (two different terms to me). I've never tasted truffle oil, or Scharffenberger chocolate, or other high falutin' ingredients I can't think up right now, though if you want to feed me some I'll happily try anything. 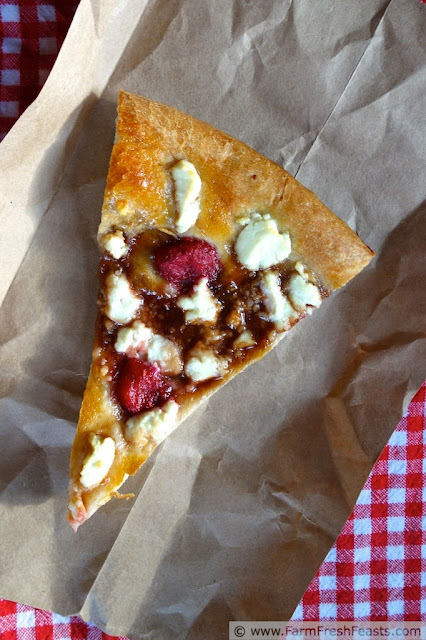 I'm still not ready to create a dessert pizza, but I'm leaning towards it with today's pizza. It's a combination of sweet raspberries and tangy goat cheese, on top of a soft and tangy buttermilk pizza dough, with a sauce of reduced balsamic vinegar syrup because this blog post got me craving it and showed me how to make it. It's a change of pace for us, a nice light summery pizza, good with a glass of wine on a shady porch. If you're interested in other fruit-on-pizza options, I've got some suggestions after the recipe. 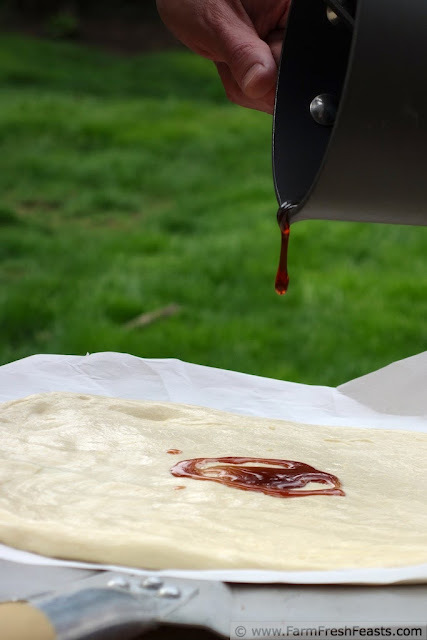 If you don't have it already, prepare the balsamic syrup as that takes a while to reduce. Preheat oven to 450 degrees Fahrenheit and if you've got a baking stone just save us all the trouble and leave it in the oven except when you're cooking a turkey, 'mkay? Otherwise use a cookie sheet. On an oiled sheet of parchment paper, stretch the dough out into a better shape than I did (on the left side in the uncooked photo it's all wonky). 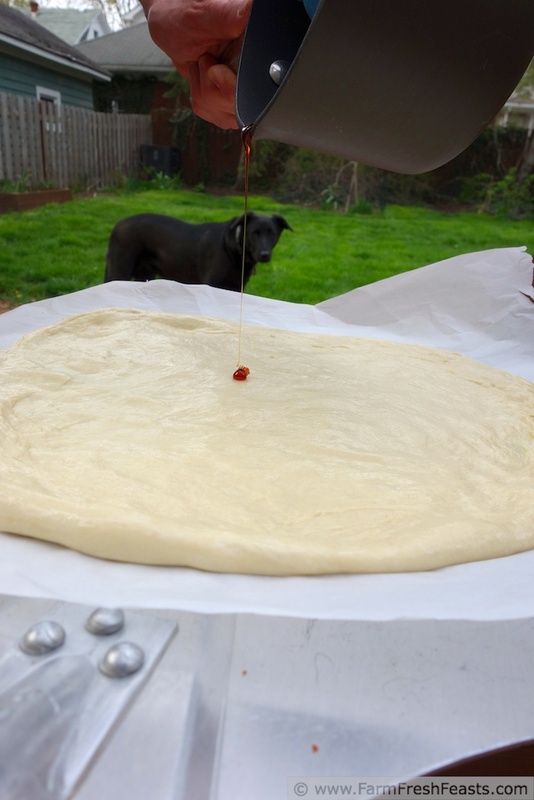 Have your wonderful spouse pour balsamic syrup across the crust while your dog photo bombs the shot. 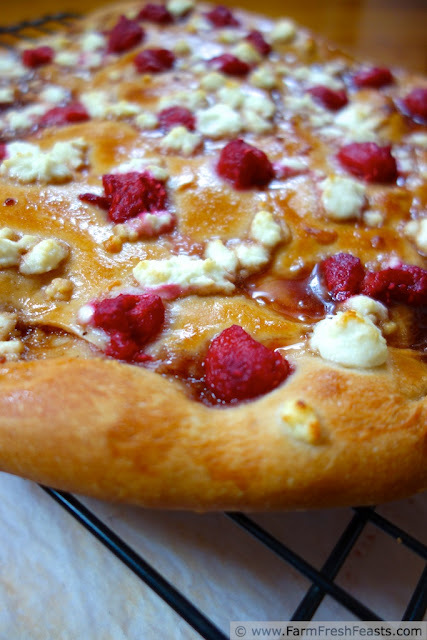 Top with raspberries and goat cheese. Bake, on the baking stone or cookie sheet, for 5-8 minutes until the crust is ready to take a few toddling steps towards independence, and shimmy it onto the bare stone or sheet. Bake another 3-5 minutes until the cheese is browned. Cool on a rack, top with cracked pepper*, slice with the best slicer I've ever bought, and serve (on a porch? with a glass of wine?). *Freshly cracked pepper. This is one area I will fully own the food snob title. I cannot stand the dry dust that comes in prepackaged salt & pepper shakers so much that I travel with a pepper grinder. When I say travel, I mean when we move, and our belongings go on crates and float across the ocean (or in boxes on a truck) the weeks/months without freshly cracked pepper got to me and I picked up a second pepper grinder at the thrift shop in Japan. Now I'll pack one in the box, and take my handy dandy pepper grinder with me to use until I'm reunited with my kitchen stuff again. So you may remember I took this 30 Days to Better Food Photography Challenge back in April? Well, I'd visualized the shot I wanted, the evening light was right, I thought I had everything set up. Then, Simon appeared, looking quizzically at our strange activities in the back yard. D'oh! Photobombed by the dog! How rude! This pizza is shared at the From The Farm Blog Hop, the Clever Chicks Blog Hop, Tasty Tuesdays, Wednesday Fresh Foods Link Up, What's Cookin' Wednesday, and What's In The Box. I think raspberries have just passed us by here, but I'll have to keep this in mind for next year. I've been seeing a lot of fruit pizzas with balsamic lately. I should really give it a try. Dessert pizza--My mom used to make one that I loved, though it was a "pizza" in the sense that it was round and had toppings. A large chocolate chip cookie (like a cookie cake) topped with vanilla pudding and artfully arranged fruit. I'm going to do it again this week, if I get my pen to paper, and share the peach pizzas I made last week. Yum! There are also fall raspberry varieties. I used to love picking after the kids went back to school--the temperatures were nicer too. Now I could go for a cookie. Please come by and see the PEACH recipes I posted last week! Oh, thank you--I've got several more peaches and I'd love some ideas! The only dessert pizza I ever ate used a sugar cookie dough and sweet toppings. I love the thought of raspberries and goat cheese Now where to pin it dessert or healthy eating? Followed you here from the Farm blog hop. New link up, Real Food Fridays, love you to share. I like link ups, I'll come check it out. Simon is fabulous. I think he should photo bomb shoots more often, and I think you should make raspberry pizzas more often so I can ogle them. Obviously. Raspberry picking started late in Ohio this year (heck we just got blackberries in our CSA) so I think there's a chance I can still go picking. I need to look into that, especially since raspberries are my favorite. The photography in this post is phenomenal; so clear and crisp. Nice job. Gorgeous! I'm far too hungry to have seen this post. Off to the kitchen now! Tammy, I'm still looking for the best time to read other blogs. It just makes me hungry--so far about 5-6 am seems to work because I have the whole day ahead of me to eat. I think my boyfriend would hate this but I would love it. Will have to save this recipe for a night he is away. Great flavors ! Always always treat yourself to food you like when you're fixing for just you. It really turned out well. Have you ever stopped to count how many vinegars you have in your pantry? I was embarrassed the first time I realized I had so many. Sure, I've got white, and apple cider, and rice, and balsamic, and sherry, and red wine, but those are all the basics, right? I only have 1 fancy one, the pomegranate. Still, the total is shocking. Very cool! carolyn oohed and aahed at this one- so I will be making it! Stewart, Carolyn is a smart woman! I am totally intrigued by your buttermilk pizza dough! I also love the balsamic with raspberries here (and what could ever be wrong with pizza and goat cheese)? Looks fabulous! I just picked up more marked down buttermilk (though I wanted to ask the guy '50 cents, is that the best you can do?' :) ) so I'm making more buttermilk dough this weekend. Easy, tender, tasty. I love raspberry but even though to eat it with goat cheese. I hope you do try it. It's a great combination. You can keep saying it every week. I don't mind reading it! ;) Not at all. Not one bit.